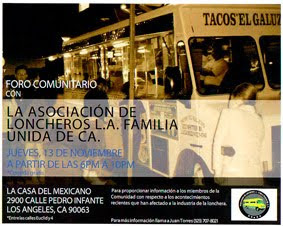 When I look at the map of the taco trucks I have covered so far on this blog the San Fernando Valley seems to be neglected. Yeah the Eastside is where a lot of the action is but for me the SFV is totally unexplored territory. There’s no dominant player in the SFV like there is on the Eastside, which makes it all the more interesting. So I paid the SFV a visit. It was late at night and I had been driving around for a while. My iPod was turned to Tchaikovsky’s Swan Lake and I drifted through the streets as gracefully as one does behind the wheel of a couple tons of rubber and steel. The streets were dark and I felt like I was completely lost, both physically and in the music. 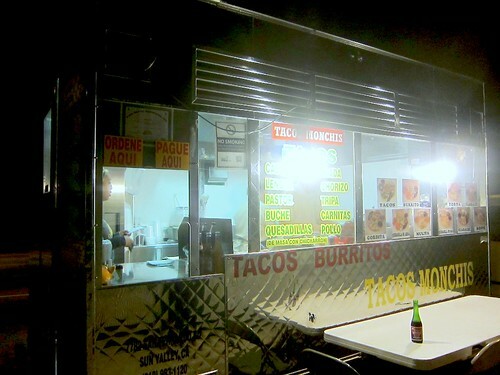 I thought about the old days when I barely knew any part of the city and would just drive around until I saw the flashing lights of a taco truck. And then out beyond the traffic light I saw a flashing taco sign mounted to the roof of a wagon. I had no choice but to acquiesce. There were a couple of other gents waiting for their tacos. They were surprised to see me. Everyone is always surprised to see me. Not that they knew I was a taco reporter, although it’s possible they did, because of the photo taking and all, but I think they were more surprised to see the guero who looks like he took a wrong turn somewhere off Sepulveda. I ordered chorizo, carne asada, and al pastor. 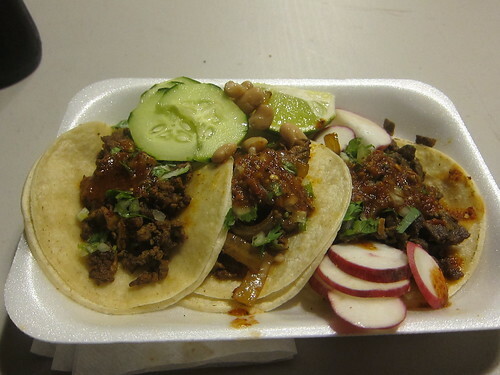 My tacos came topped with a bean tostada, which is customary with SFV taco trucks. I ate the bean tostada before snapping the photo then noticed that some of the beans had escaped. Their defiance only bought them a few seconds more of freedom as I devoured all but one of them with my first taco. The remaining bean I flicked off into the night as a warning to any future beans that have thoughts of mutiny. The thinly sliced cucumbers were a nice touch. As for the tacos they were above average. The tortillas were nicely oiled; the asada had good flavor and was missing those fatty bits that so often can ruin a taco. The chorizo actually had a sausage-like texture. I think I enjoyed this taco the most. As for the al pastor it was edible but far too oniony. The salsa, a mix of guajillo chile and chile arbol was spicy enough but some variety of different salsas would have been preferred. I drove around a little more but the night was growing old on me. I felt like a cold beer more than I did another taco. And I wasn’t having any luck anyway. So I got back on the 5 freeway and headed home. Does anybody know what days he comes to his normal location? Arleta and Osborne? Did he change location?